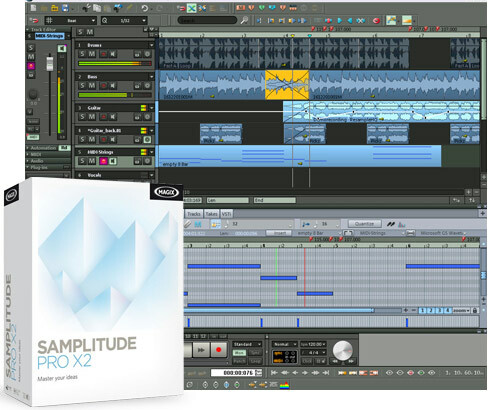 Samplitude Pro X2 is the perfect DAW for audio productions without compromises – from arranging and recording, to editing and mixing, all the way to professional mastering and authoring. Work with a fully customizable interface and experience a DAW tailored to your needs. The precision audio engine with full bit transparency, outstanding high-end plug-ins, 5.1 Surround mixing and the ability to be seamlessly integrated into your studio workflows make Samplitude Pro X2 the most powerful audio workstation on the market. • 64-bit support: take advantage of a 64-bit application and 64-bit plug-ins. Naturally, Samplitude Pro X is capable of running on both 32-bit and 64-bit systems and 32-bit plug-ins are still supported. • 100% sound neutrality & fidelity: transparency, neutrality, spaciousness and retention of transients – even during intense digital editing processes, the sound retains its acoustic nuances thanks to full bit transparency. • Object editing: complete editing at object level, including effects, plug-ins, fades, equalizing, timestretching, pitchshifting, AUX sends and freeze. Completely non-destructive & real-time! • NEW! New docking for a program interface that is individually adjustable via drag & drop. Includes docking for Object & MIDI Editor and visualization!